I love to escape into books at any time, but when there’s a lot going on in the world and in my day-to-day life, that escape becomes more precious and important. Or, if an escape isn’t going to cut it, a book reminding me to savor beautiful everyday moments is even better. M.H. Clark and Madeline Kloepper’s picture book Tiny, Perfect Things encourages readers young and old to take a walk outside with a loved one, pay attention, and celebrate the act of discovery. The whole world is a treasure waiting to be found. Open your eyes and see the wonderful things all around. This is the story of a child and a grandfather whose walk around the neighborhood leads to a day of shared wonder as they discover all sorts of tiny, perfect things together. With rhythmic storytelling and detailed and intricate illustrations, this is a book about how childlike curiosity can transform ordinary days into extraordinary adventures. A girl and her grandfather take a walk along a nature trail and through their neighborhood. Along the way they take turns pointing out the tiny, perfect things they see – a spider web, a bottle cap, a group of crows, and so on. As the sun begins to go down, they head home to celebrate their discoveries with family, and to plan another adventure. Tiny, Perfect Things is a quiet, contemplative picture book that revels in the wonder of the commonplace. It urges readers of all ages (but especially very young ones) to become everyday observers as they move through the world, and to look for so-called “hidden” marvels. On each page there are unexpected or partially concealed details for readers to find. Uncovering these elements one by one will prompt interaction beyond the text. For children too young to read, this book will be a good one to page through by themselves – with its pages full of treasures it invites telling a story to oneself. It is also a good candidate for a bedtime story – the rhyming text ends as the day ends, and the characters muse about what the next day may hold. I’d put the ideal reading age at 2-5. Let’s talk about the art! Kloepper’s art is exceptional, warm, and unaffected. The colored pencil-filled pages are full of delightful details, and yet the lines and strokes are visible enough to prompt kids to mimic them. It’s art, but it’s also artful – the whole book is a feast for the eyes. I include in that the gorgeous production (there’s a yellow cloth binding and embossing on the cover), beautiful endpapers, and a fold-out page spread at the end. It’s pretty enough to be a gift book and practical enough to be a kid-favorite, and that’s the best of both worlds, as far as I’m concerned. Other (good) things to mention: the family in the story is blended, there isn’t a dust jacket, and while it isn’t nonfiction, this would be a good book to pair with other nonfiction nature-filled picture books, such as The Things That I Love About Trees and Over and Under the Snow, and as a precursor to STEM-friendly titles like Ada Twist, Scientist. 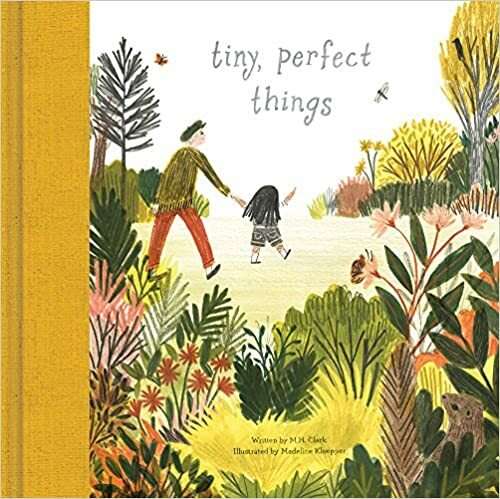 In all, Tiny, Perfect Things is a delightful, tranquil picture book, and should be a hit with most of the preschool set. Fine print: I received a copy of this book from the publisher for review consideration. I did not receive any compensation for this post.